Well, it's that time again. Autumn is upon us and it's a nice time of year to grab those colourful shots. For one reason or another I don't have a great deal of Autumn photographs in my library, although I try to rectify this every year and fail miserably. Again, in Autumn 2009, the weather has been poor on my days off so I haven't managed a great deal as far as decent shots are concerned. Of course, as I write, there's still a couple of weeks to go before the leaves have all fallen so all is not lost - fingers crossed for a lovely sunny day or two. Last Sunday I popped out for an hour before lunch. 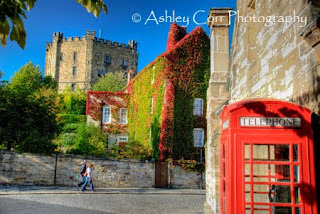 I headed over to Durham Cathedral and the nearby Palace Green, where, on a previous visit, I noticed a nice potential Autumn shot as the leaves on a house were starting to turn red. I grabbed a couple of shots and headed out of the City Centre in search of more shots. As you can see in the photograph, the colours are lovely, but maybe a week or so later I would have captured more red leaves and less green. Nevertheless, a nice shot. 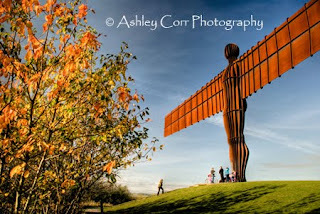 Then there was a quick stop-off at the Angel Of The North. Just one tree was showing any kind of decent colour so I took up position to include it in the shot. Here it is. Every Saturday, except when I'm working, my wife and I jump into the car and find a nice quiet pub for a drink and a spot of lunch. We've found some great pubs on our travels over the last few months and it's just nice to get away from it all for an hour or two. If the weather is nice we normally go for a stroll to brush off the owld cobwebs - knar wot a mean? Barnard Castle was where we ended up this time. We parked up near the Castle and headed off in search of a pub with grub. An hour later, after being fed and watered we had a walk along the riverside and then back up the hill for a quick look around the shops. 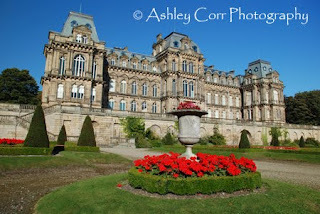 Just before we left for home we stopped off at Bowes Museum and it's lovely gardens. Aye, a nice afternoon all round. The day was Saturday September 12th 2009. My original plan was to head north up the A1 and grab some panoramic landscape shots of Alnwick Castle. It was 11.00am and after realizing that the sun had risen around 5.30am, I had a feeling that by the time I arrived at the castle the sun would have been shining on the wrong side of its walls. Well, I got there to find exactly that. My intended vantage point for photography was now out of the question as the walls were in shade and from where I was standing...well, not much point in flogging a deed horse! So, that was that - it was now time for Plan B. 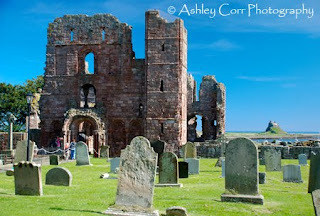 Plan B was a hastily arranged trip to Holy Island & Lindisfarne, which was a few miles further north. I say 'Hastily' as it was decided in a matter of seconds without any prior knowledge of the day's tide tables. Anyone who knows Holy Island will be well aware that the causeway is flooded at high tide, preventing motorists from making the crossing. I got lucky. I took a few shots of the priory ruins before taking a short break on the sand banks nearby. I was planning to photograph the Marina after taking in the tranquil setting for a few minutes. The Marina area is quite photogenic, with old upturned cobles here and there, plus a scattering of lobster pots and anchors. 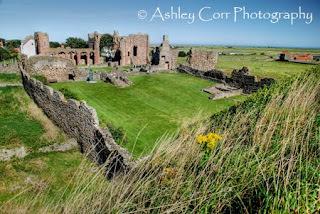 Before heading off for a spot of lunch at Seahouses, in the shape of Haggis n' Chips, I took a few shots within the grounds of St Ann's Church, including a lovely panorama of Lindisfarne Priory which can be viewed at ashleycorr.com. Having bought a National Trust membership and not used it in months, I thought it was high time I got my act together and got my money's worth. 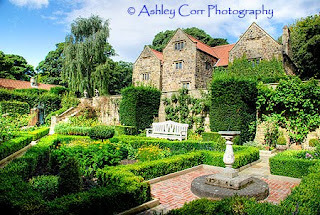 It was a lovely warm day and I didn't fancy a big drive, opting to stay local and pay a visit to Washington Old Hall. I grabbed a few photo's inside the hall during my last visit in 2008, so this time I hoped to grab a few in the grounds. The Jacobean Gardens are very photogenic and depending on what time of year you visit, there's a variety of colour in the many plants within the grounds. 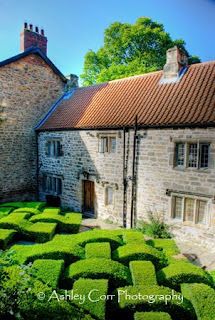 The adjacent Nuttery didn't have a great deal to offer although it was the ideal 'Secret Garden' to get away from it all. I was lucky enough to photograph the intricate topiary near the site entrance, shortly after a fresh cut from the resident gardener. The photograph was very similar to the one I shot last year which was used on the St Benedict's 2009 calendar that I contributed to. Well worth a visit. It's that time again. It doesn't seem five minutes since the 2008 Great North Run. In many ways today, the day of the 2009 run, is very similar to last years event. I find myself on the Tyne Bridge in Newcastle and the area is packed with spectators on another sunny day in September. The drummers have turned up again, adding to the carnival atmosphere that has made this event a big hit since it started back in 1981.
from one location only. Naturally, many of the roads were closed to allow the run to take place, so driving from location to location on the route had it's problems and car parking was a nightmare too. So, the Tyne Bridge was an ideal backdrop for todays photographs and I was armed with a set of fresh batteries and an empty memory card - it was time to roll. At around 10.30am the first disabled runners came through, follwed a few minutes later by the Elite Woman. Next it was the turn of the Elite Men, followed by the baggage coaches, and there were plenty of them! 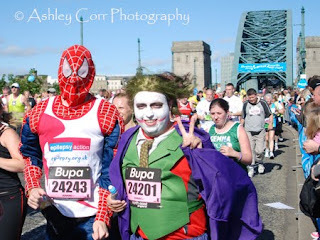 Soon enough the main race started and thousands of runners were heading towards me on the Tyne Bridge. Many were in fancy dress and I kept my eyes peeled for the odd celebrity or two, which isn't easy when there's so many people running towards you. I fired off dozens of frames in sports mode, often catching runers with a series of staggered shots. The old stick standing next to me kept telling her grandchildren that she's seen this one and that one from Emmerdale - I never saw them, and even if I did I wouldn't admit it...he he. Then I heard her shout 'Hello Mr Ramsey'...bloody hell, the swearing chef had just ran past me! I did manage to catch a couple of celebs on camera though. Jerome Flynn, half of the Robson & Jerome double act, and someone from Emmerdale...oh no, did I just say Emmerdale! Oh, go on then. I stayed until the last runners had gone past, and followed shortly after by the 'Sweep Vehicle' that was clearing the road so that the bridge could resume normal service. Well, by this time it was almost mid-day so I made the short journey back to my car in Gateshead and then off home where a lovely big fat lamb roast was about to be served up. The Mrs, she's a little diamond...so she is!